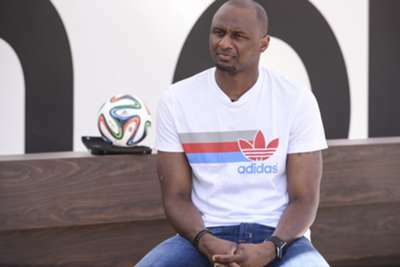 ​Arsenal legend Patrick Vieira feels their historic 49-game Premier League unbeaten run can be beaten, perhaps by this season’s Chelsea side. Vieira was captain of the Arsenal team that famously went the entire 2003-04 league campaign without losing a game, earning them the ‘Invincibles’ moniker. The streak was eventually ended in October 2004 following a 2-0 defeat at Manchester United. Chelsea have yet to suffer defeat in eight games this season and sit five points clear at the top of the Premier League with 22 points, having played some scintillating attacking football so far in 2014-15. Diego Costa, in particular, has been outstanding for Chelsea, netting nine league goals after his close-season move from Atletico Madrid. And Vieira believes that Jose Mourinho’s men have the ability to emulate Arsenal’s achievement from a decade ago. “I think a team will do better than that,” Vieira is quoted as saying by The Daily Mirror. “But how long it will take we don’t know? Maybe, Chelsea. “I think one day that record will be beaten. I think that Chelsea look really promising. They have not specially played well but they keep winning and they look really strong. Chelsea visit Louis van Gaal’s United on Sunday.